Green Screens work by combining images/video from two sources into a single image. The two sources are layered on top of each other, with parts of the top layer being filtered out to allow the bottom layer to show through. The green screen/chroma key filter that looks for and then renders transparent a particular colour (in this case, green). 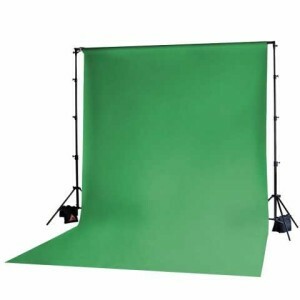 Green is often chosen because it is not a colour found in any human skin tones, thus preventing the people being filmed from being filtered out. Filming in front of a green screen with the desired image being superimposed simultaneously. Filming in front of a green screen with the desired image being superimposed later during editing. Note: This app only supports still images. If you are unable to purchase an app, iMovie and other video editors are also capable of applying the Green Screen effect. You would need to pre-record your video or image, import it into the video editor of your choosing, and add your background/foreground images during the editing process. Here is a video tutorial for creating green screen movies in iMovie, and a text-based tutorial directly from Apple Support. If possible, your green screen should be placed directly against a wall. Not only will this prevent people from knocking it over, it will also prevent light from filtering through the back side of the screen which could affect the quality of your video. Ideally, the green screen should continue onto the floor instead of just being on the wall so that students are able to stand “in” the scene, rather than just in front of it. The screen should be as smooth as possible, eliminating any wrinkles, folds, shadows, etc. that may interfere with the background. Additionally, ensuring that the screen is well and evenly lit will prevent distortion of the background or an uneven transparent effect. If you are interested in creating green screen video but don’t have a traditional screen, you can create your own using inexpensive materials. As long as the material you are using is fully saturated and opaque, it will function the same as a professional green screen. Note: If there are any gaps between the folders or shadows from overlap, this may affect the transparency of the ‘screen’. Students will use speaking skills and strategies appropriately to communicate with different audiences for a variety of purposes. Students will reflect on and identify their strengths as listeners and speakers, areas for improvement, and the strategies they found most helpful in oral communication situations. Students will create a variety of media texts for different purposes and audiences, using appropriate forms, conventions, and techniques. Students will reflect on and identify their strengths, areas for improvement, and the strategies they found most helpful in understanding and creating media texts. Expression and organization of ideas and information in oral, visual, and/or written forms. Communication for different audiences and purposes. Use of conventions, vocabulary, and terminology of the discipline in oral, visual, and written forms. Expression and organization of ideas and mathematical thinking using oral, visual, and written forms. Communication for different audiences and purposes in oral, visual, and written forms. Communication for different audiences and purposes in oral, visual, and/or written forms. Use of conventions, vocabulary, and terminology of the discipline in oral, visual, and/or written forms.